A lightweight, padded drop mat, specifically designed for working at height over Kennedy grating that can also be used as a windbreak. A certified lifting bag with a safe working load of 25kg for transporting tools up and down ladders safely, i.e. spanners, torque wrenches, nuts, bolts, gaskets, etc. An 8 metre load bearing braided rope with stainless steel screw lock carabiners attached to each end that can be secured to the lift bag and hand rails at the top of the ladder. A barrier pack consisting of two wallets, two warning information signs, marker pen and 2 metre, 4 metre or 6 metre quick release webbing clips, providing a total barrier coverage of up to 12 metres. 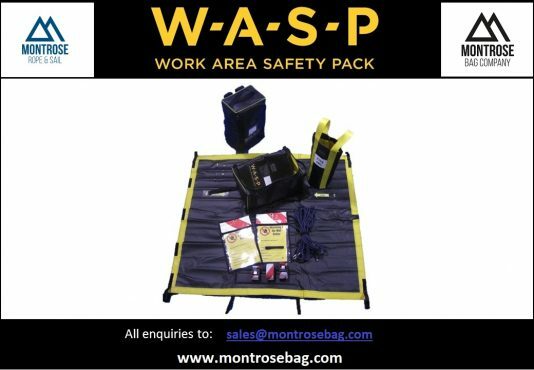 If you’re interested in one of our W-A-S-P packs, please get in touch at sales@montrosebag.com and we’ll send you a quote.